Raglan Engineering was founded in 1942 - in the middle of the Second World War - by a Mr. Watkins in premises at the top of Raglan Street, in the St. Anne's district of Nottingham. The company's first move was to a disused chapel at the bottom of the same road and then, in the early 1950s (just before the introduction of the more highly developed "Five-inch" model) to Raleigh Street, Radford, Nottingham. This move may have coincided with some financial difficulty for subsequent machines are badged "Raglan Engineering Co. 1954" - a year suffix being a common way of continuing with an established brand having first conveniently abandoned the original company's liabilities. . The work's manager at one time was Sam Tracey and the foreman Henry Newman. It is not known what branch of engineering occupied the early years of the company existence, but the first Raglan lathe appeared on the market in the late 1940s - and the company survived until 1971 when, having been taken over by the Myford Engineering some years earlier, it was closed down as being uneconomic to run. 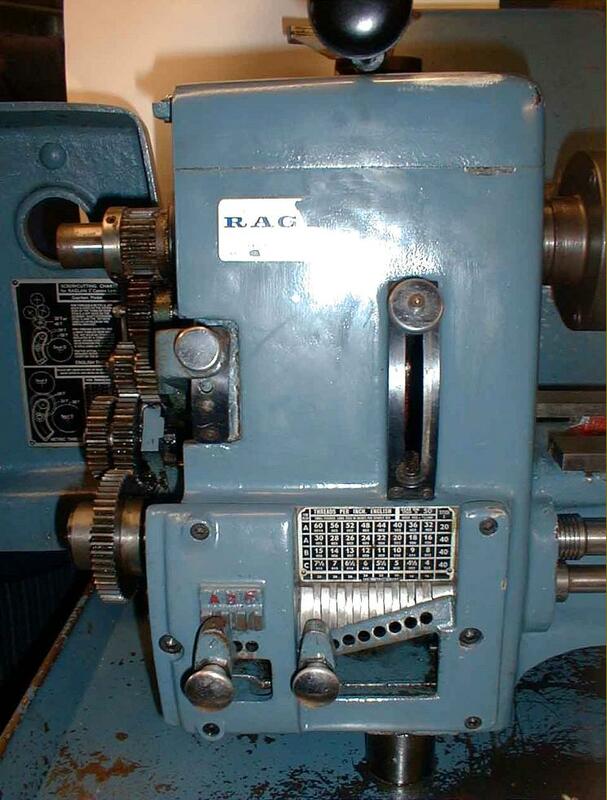 Raglan always competed at the top end of the 5-inch lathe market, but confined their range to variations on just a single design - a backgeared, screwcutting lathe that passed through three distinct evolutionary stages: Little John Mk. 1, Little John Mk. 2 and the "Five-inch" all with a 5-inch centre height (actually 5.125") and 24" between centres. A capstan version was made in Mk. 1 and Mk. 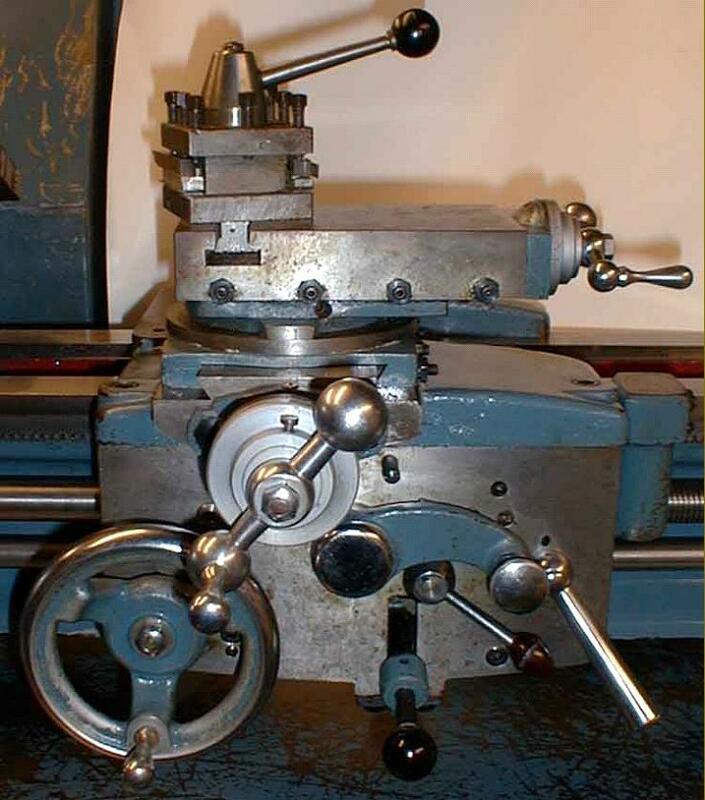 2 forms and a combined capstan and centre lathe also produced in small numbers. A few specialist models, for wood turning and preparing tensile-testing samples, for example, were also offered - but all these machines were based on the ordinary centre lathe. A simple plain-turning, non-backgeared 5" x 15" training lathe, the "Loughborough" - again using the same form of bed, carriage and No. 2 Morse taper tailstock of the little John - was also listed and bought mainly by colleges and schools in the Midlands. The Loughborough was always fitted to a sheet-metal under-drive stand with an enclosed, 3-speed flat-belt drive to the headstock. Unfortunately, although a very strong lathe, its limited speed range and basic facilities make it unsuitable for general use or even the simpler kinds of model-engineering work. However, it does make an excellent lathe for roughing out and taking the load off a more expensive machine. From the late 1950s until the late 1960s a small but very well made variable-speed drive vertical miller (with its main column cast, rather unusually, in aluminium) was also listed. All Raglan lathes were works-tested in a "free-standing" position and, when bolting them down to a bench, care has to be taken not to stress and twist the bed. To aid this, the tailstock end of the bed has only one holding-down bolt and the underside of the mounting foot is made slightly convex to allow it to find its own position. To mount the lathe, bolt the headstock end down firmly onto a flat surface but only tighten the tailstock end sufficiently to position it; the half compression of a spring washer under the bolt head is a good guide as to how tight it should be. Because it is impossible, once the lathe has stopped, to change the speed setting, try to get into the habit of reducing the speed before switching off; this allows the motor a much easier time on start-up and will prolong its life. Cast as one 43-inch long piece, the bed and headstock of the Little John was enormously rigid while the bed's ways, made from separate hardened flat steel strips, each 1.5-inches wide (separated by a 3.165-inch gap) could (in theory) be unbolted, reground and replaced. On first assembly the top of the lathe bed casting was surface ground then a "dummy" bed (complete with its hardened bed strips) placed inverted on top and used as a "surface plate" to guide the final hand scraping whereby a truly flat surface was obtained. In addition to quality-engineering, backed by a fine cosmetic finish, the feature for which the Little John and "5-inch" became best known was a mechanical, variable-speed drive unit built onto the back of the headstock. One half of the expanding-and-contracting pulley system was mounted on the electric motor's spindle while the other was carried on bearings beneath the headstock - with an extended shaft that held a twin V-belt pulley that drove the main spindle with the belts passing vertically upwards inside the casting. The system was robust and reliable but suffered, when fitted with a single-phase motor, from a rattling thrust bearing at slow speeds - lathes with a 3-phase motor, being driven much more smoothly, were free of the problem. The thrust bearing is fitted with two adjustment screws and these are supposed to put the unit under a light preload to prevent end play and the resultant rattle. If the bearing is in good condition this should work, but on a worn bearings the effect is quickly lost (a clue as to how awkward this setting might have been to achieve is that the makers used a special jig to get it correct). A crude work-around for the amateur owner (and only sometimes successful) is to take another load - a fan heater or single-bar electric fire for example - from the same electrical socket to which the lathe is attached. The normal spindle-speed range was approximately 290 to 1750 r.p.m. in direct belt drive and, with the very robust (approximately 7 : 1 ratio) backgear engaged, 38 to 260 rpm. The standard motor was a single-speed 0.5 h.p. 1425 rpm unit but a few lathes were built with 2-speed motors and a higher top speed. A special "High-Speed Spindle" model was also offered, driven by a 1 or 1.5 h.p. motor, with a top speed of 2500 rpm; however, this lathe - and it is very rare - omitted the screwcutting facility and had its power feeds driven by 3-step Vee pulleys and "pick-off" gears rather than the screwcutting gear train and power-shaft combination of the standard lathe. While the main variable-speed belts are still available the twin V-belts to drive the spindle are a problem: because there is a very limited range of adjustment the belts were originally made to tight tolerances in a special mould; today a belt of nominally the correct size will often be too long or too short - the solution is to use a pair of T-link belts that can be adjusted by adding or removing links (all belts are available from lathes.co.uk, just email for details and current prices). With a smooth, rounded cast-iron headstock cover, the Mk. 1 Little John used, on very early versions only, plain parallel-bore bronze bearings held down by two-bolt caps. After this a switch was made to Timken taper roller bearing - still held in place by the same bolt-on bearing caps until, on the revised Mk. 2, a significant increase in rigidity was achieved by moving to a conventional one-piece headstock casting with the bearings pressed into line-bored housings. As far as is known, both front and rear bearings had the same "stepped" outer race, No. 16284B, with the rear inner marked 16150 and the front probably the same - but this is not confirmed. Made in cast iron (though the occasional example in aluminum has also been found), the changewheel cover pivoted on a rear-mounted hinge (a return was made to this design on the later Raglan "5-inch") and the variable-speed control lever carried on a cast-iron post bolted to the headstock end of the bed. The next version, the Mk. 2 (by far the most common Raglan model found today) can be recognised by its flat-topped, one-piece headstock with bevelled edges around the top and a simple changewheel cover that lifted off two little pegs let into the top of the headstock. 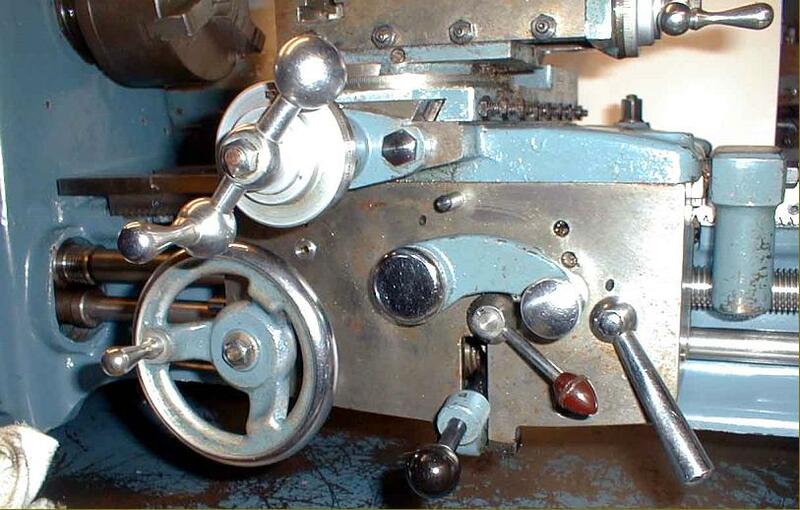 All versions of the lathe had a 4-Morse taper headstock spindle (with a square-thread, 1.75" x 6 t.p.i. nose) that ran on taper-roller bearings and was capable of passing a 1" diameter bar. Screwcutting was by changewheels only on the Mk. 1, but by changewheels or the option of a screwcutting gearbox on the Mk. 2. With changewheels the threading range ran from 4 to 48 t.p.i or, with the metric conversion gears fitted (52t and 44t supplied with the lathe) 0.25 to 4 mm pitch; the standard changewheel set included the following gears: 2 x 30, 32, 36, 42, 44, 45, 48, 52 and 60t. Gearbox-equipped machines generated pitches from 4 to 30 t.p.i. with the standard gear train in place or, by swapping just one changewheel, up to 60 t.p.i. metric threads with the gearbox version spanned a (maximum) range of 0.5 to 5 mm pitch. The arrangement of the changewheels was unusual with the whole gear train carried on four fixed instead of the more common moveable studs. The makers claimed that this design introduced an element of simplicity into the system - but in reality caused more problems than it solved. Power feeds and screwcutting were separated, with the feed-shaft turning continuously and the 0.75-inch diameter, 8 t.p.i. leadscrew driven from it by a pair of gears at the headstock end. The gear on the leadscrew was arranged to slide in and out of mesh--so allowing it to remain stationary except when required--a spring loaded 3/16" diameter ball bearing loaded by a 1/8" diameter by 5/8" long compression spring being used to index the engaged and disengaged positions.. Power feeds (along the bed, across and neutral) were selected by a knob that could be slid, horizontally, and then lifted into one of three positions on the apron. Rates of sliding feed varied from 0.003" to 0.050" per revolution of the spindle with surfacing at 1/10th that rate. The 0.75" diameter, 8 t.p.i Acme-form leadscrew, used only for screwcutting, was engaged by sliding a gear, mounted at the headstock end, into mesh with a corresponding gear on the power-shaft below. As an interesting economy measure, the leadscrew clasp nuts were pressure die-cast in ZAMAK and bought in from Atlas - being identical to the ones used on that Company's 10-inch lathe..
A disadvantage of the apron fitted to both the Mk. 1 and Mk. 2 was the difficulty of getting the power feed out of mesh under the stress of a very heavy cut; there was no separate disengage lever fitted and the whole mechanism could "load up" very badly, especially on a machine that was well worn. The apron fitted to the later "Five-inch" model completely solved the problem and had one of the lightest yet most positive feed-release mechanisms ever encountered by the writer. A suitably rugged compound slide unit was fitted with the top slide dropping over a stout post on the cross slide - the design being an exact copy of that used on the well-known American Atlas 10-F lathe. The top slide was retained by pusher screws bearing against bars with their ends machined to match the an inverted taper machined into the post; getting the slide off can require a good amount of jiggling and wresting. Unfortunately the T-slot in the top slide was machined rather close to its end face and, with the corners of the slot also left too sharp, weakened it to the extent that, under severe stress, it is not unknown for the end of the slide to snap off. However, it must be said that either the most severe provocation is needed (on other lathes, such stresses would probably have mangled even more expensive components) or continuous heavy use that has induced metal fatigue. If yours is broken, we try to keep in stock new top slide upper castings, fully machined and ready to fit. Cross and top-slide feed screws were 10 t.p.i. Acme-form threads and fitted with zeroing micrometer dials of a decent size and fitted on spring-loaded sleeves to provide the necessary friction to hold a setting. Tailstocks were entirely conventional having a No. 2 Morse taper barrel and a powerful, lever-operated bed clamp. A proper split-barrel assembly locked the spindle, though its operating lever was rather short. Normally found stamped rather lightly into the top of the cast bridge between the bed walls at the tailstock end of the lathe - where years of dirt and layers of paint often obscure it - the machine number is also sometimes found on the machined face against which the tailstock-end leadscrew bearing hanger bolts. The lowest number so far discovered for a Mk 2 is 970 - and it may well be that numbering started at 900 for this model. A wide range of accessories was offered including a vertical milling slide (that fitted over the stud used to locate the top slide) with a neat swivelling machine vice (this unit was either a copy of, or much more likely, bought-in from Atlas; a single-pulley drive attachment to replace the normal drive system; T-slotted cross slide (two slots at the rear only); fixed and travelling steadies; a taper-turning unit; collet sets (draw-in and spindle-nose mounted); production equipment including bed-mounted capstan and cut-off slides with either lever or screw-feed; a tailstock capstan attachment; a tailstock lever-feed assembly; toolpost grinder; large faceplate; American style and 4-way toolposts; micrometer carriage stop; T-hand rests for wood turning and metal spinning; T-slotted boring table to replace either the cross slide or the vice on the vertical-milling slide; angle plates and light units, etc. Without their cabinet stands, both the Mk. 1 and Mk. 2 machines weighed approximately 3.5 cwt (392 lbs or 178 Kg). Raglan "Little John" Mk. 2 The top slide fitted over a post on the cross slide - the design being a copy of that used on the well-known American Atlas 10-inch lathe. The Raglan vertical milling slide (which fitted in place of the top slide) was also a copy of that used on the Atlas. Called simply the "Five-inch", the final production Raglan lathe had a rather prosaic title for what was, undoubtedly, the Company's finest-ever (and rather expensive), product. In 1966 the basic model was listed at just under £300 but, mounted on the cabinet stand (£36 : 15s : 0d) and with a screwcutting gearbox (£37 : 16s : 0d) a 5-inch 3-jaw Burnerd chuck (£16 : 1s : 9d) and a faceplate (£4 : 11 : 6d) this rose to just short of £400. To put that figure in perspective a Myford Super 7, to the same specification, was a few pennies under £200 - with the take-home salary of a newly qualified teacher that year being just £55 a month. Even though they looked rather different, the headstock and bed of the 5-inch were dimensionally identical to the earlier models - as was the mechanical, variable-speed drive system that, on the standard machine, could rotate the 11/32" bore Timken taper-roller bearing spindle at speeds between 38 and 1750. Again, as with earlier versions, a "High-Speed Spindle" model could be specially ordered with a top speed of 2500 rpm; however, model omitted the screwcutting facility and the power feeds were driven by V belts and "pick off gears" rather than the screwcutting gear train and power-shaft combination of the standard lathe. Major modifications to the 5-inch that significantly improved the lathe concerned the screwcutting arrangements, saddle, apron and compound slide. An interesting point concerned the new cross slide that, while much wider than that on the Little John, was significantly shorter than the ways on which it ran - the reason being the need to accommodate a taper-turning unit. Of the latter attachment there were two types, the earlier being an almost exact copy of that used on the Atlas 10-inch and the later one of Raglan's own design carries on twin bars. Over time the short cross slide caused the ways to wear more in the middle than the ends; however, if the optional, full-length slide with a T-slotted section at its rear was used, the difficulty vanished and wear was both slower and more evenly distributed (though using the T-slotted slide precluded the fitting of a taper-turning attachment). Very early versions of the 5-inch had shorter cross slide ways, the subsequent 1-inch increase in length (as found on the vast majority of examples) being obtained by cantilevering the out the front of the saddle casting. The rack-pinion gear was, initially, carried over from the little john but this weak point (the teeth eventually snap off) was replaced by a stronger unit with a larger gear on a shaft with its end section increased in diameter. Another useful change on the 5-inch was to the cross-feed screw and nut where both were significantly increased in size to give a much better feel and a greatly extended service life. Completely redesigned and significantly improved, the apron had the carriage handwheel moved to the left-hand end and a quadrant arm on its face that moved into three indented positions to select neutral or power sliding or power surfacing feeds. Another lever was arranged to allow an instant release of the power feeds and a knock-off for these provided by a button on the left-hand face of the apron that was intended to be pressed by a new, bed-mounted stop. The remarkable ease with which the feeds could now be flicked into and out of engagement was at complete variance with the earlier system. 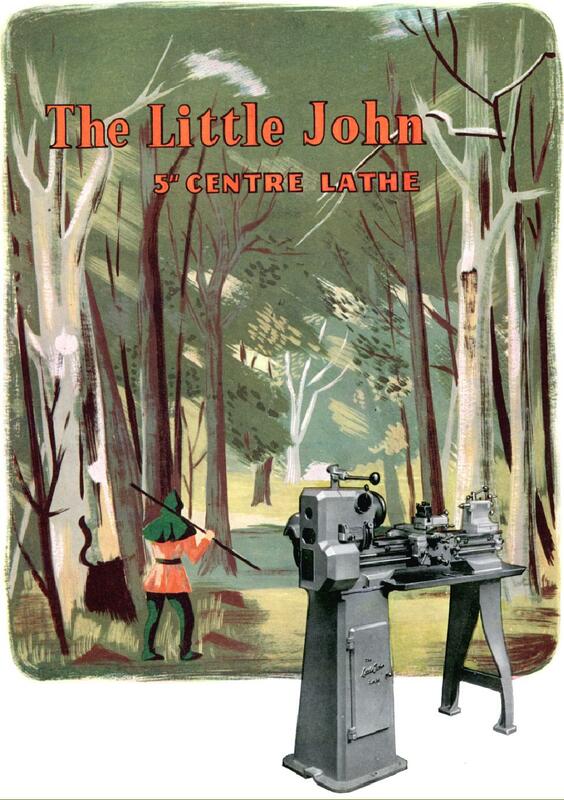 However, although the great majority of the 5-inch lathes were fitted with the new parts, a number have been discovered with the earlier apron (with a slide-and-lift lever to engage power feeds), from the Little John. 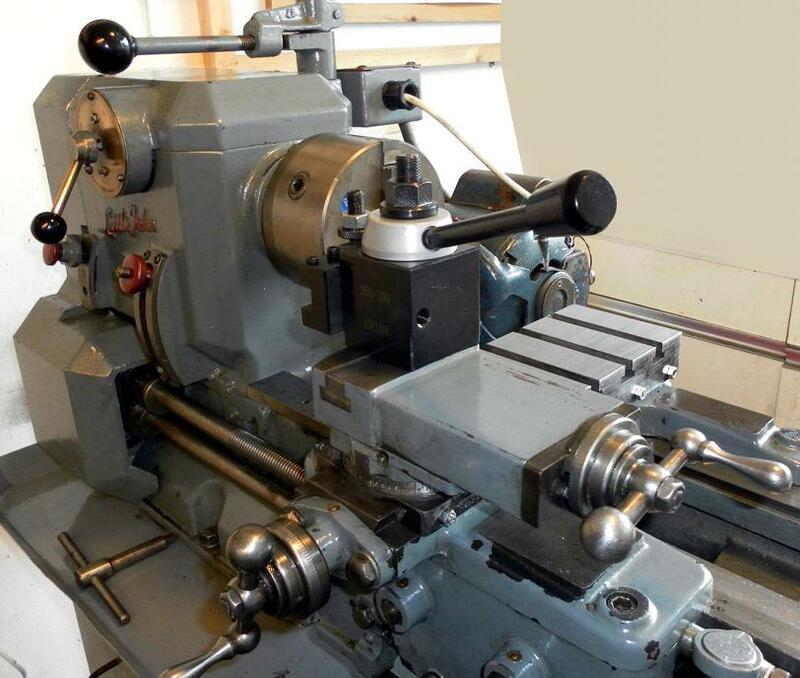 These lathes would almost certainly have been offered at a reduced price to training establishments and schools, for each so far discovered has also lacked a screwcutting gearbox. Unfortunately, as the headstock end of the bed used on the "5-inch" used a different casting when fitted with a screwcutting gearbox it is not possible (unless serious machining is undertaken) to retrofit the changewheel model. Rounded off to give it a more contemporary appearance, the headstock was much the same as before though a few machines were sold with an American long-nose taper L00 spindle fitting (as used on, for example, Harrison "Eleven Inch" and some "L5A" models) while a similar number appear to have been fitted with a rev. counter built into the headstock casting. Headstock bearings (Timken outer 16284B and Timken inner 16150) were identical left and right but the rear had a bronze sleeve to bring it down to the shaft diameter. Stronger changewheels were covered by a properly hinged guard (with a catch to hold it closed instead of the simple lift-off cover on the Mk. 2) and mounted on an easily adjusted bracket. With lots of filler used on the castings the lathe was particularly well finished and much preparation and care went into the painting. As a result, many have survived in their maker's enamel finish with only minor cosmetic blemishes - a Raglan 5-inch in fine condition is an impressive sight (and should also perform as well as it looks). Although most 5-inch models were finished in blue others, the writer has seen others, obviously ex-factory, in green and a plumy red - with others reported in grey and tan. Although the familiar blue seems to have changed in shade over the years, the following code will give something very close to the original: BS381C No 636 PRU Blue. All "5 inch" models appear to have been supplied on cabinet stands; although strongly constructed on two girder-section steel beams (and rather handsome in outline) the early versions were strange affairs that lacked a chip tray and with the switchgear mounted inconveniently and dangerously on a panel at the tailstock end of the bed - however, both these little design foibles are, of course, easily corrected. The stand used during the last years of production was based on a modified Myford Industrial Cabinet fitted with a larger chip tray and the lathe carried on simple raiser blocks made from steel bar. Assembled under the ownership of Myford, the last of the Raglan lathes can be recognised by the use of that Company's traditional "fully-machined" and chemically-blacked nuts and bolts - and the modified Industrial Stand mentioned previously. An interesting change was also made to the drive system on some machines; because the variable-speed drive pulley was mounted on the motor shaft, and needed to be an exact distance from its matching pulley under the headstock, it was necessary to use a particular make and model of electric motor. In Myford's modification a shaft, carried on a pair of simple plumber-block bearing assemblies and with the variable-speed pulley mounted on one end, replaced the motor. At the other end of the assembly was an ordinary V-pulley, driven by the motor positioned lower down on the back of the stand. This freed the makers (and subsequent owners) from the restrictions of a single-make motor, for it was now possible to use one of almost any shape or size - providing, of course, that it was of a suitable rating. This modification can be made, with great advantage, to earlier machines, especially when the original motor fails - or if a conversion is to be made from three to single-phase electrics. When considering the size of single-phase motor to use, do bear in mind the relatively high transmissions losses inherent in the variable-speed drive system; the lack of "capacitor start" on many modern motors means that a larger one might be necessary to start the lathe than to run it at top speed and, finally, the fact that a slightly over-size motor will have an easier and longer life than one that has to struggle for a living. Around 1 h.p. power should be correct but, for safety's sake, it would be unwise to go above 1.5 hp. Interestingly, Raglan themselves offered an accessory similar to the device just described; however, they rather mysteriously called it the Single-pulley drive attachment designed to: fit in place of motor when electric power is not available. Perhaps they envisaged it being driven by a separate power source, a stationary engine, water wheel or windmill, perhaps? An interesting conversion of the "Five-Inch" lathe was the Labomill "Combination" or "Universal" machine manufactured by Antony H. Croucher of Holybourne, in Hampshire. This could turn, line bore and horizontal mill and undertake both surface and cylindrical grinding. I started work at the Raglan factory in early 1969, and left about the end of that year. I was employed to build the aprons and screw-cutting gearboxes. The Company had recently been bought by Myford - and were to subsequently close it around 1971. The factory, an old three-story Victorian lace mill, was on Raleigh Street, in Nottingham. The machine shop was on the ground floor, the main fitting shop on the first floor (with the spray shop) while the second floor was used for stores and the assembly of millers, capstan lathes and the plain-turning "Loughborough" training lathe. The top floor was in the attic area and consisted of the fettling shop where all the casting came by way of an old lift. I don't know where the main castings were done, but they came in "aged" and part-finished in as much as the main bed ways had been rough machined. 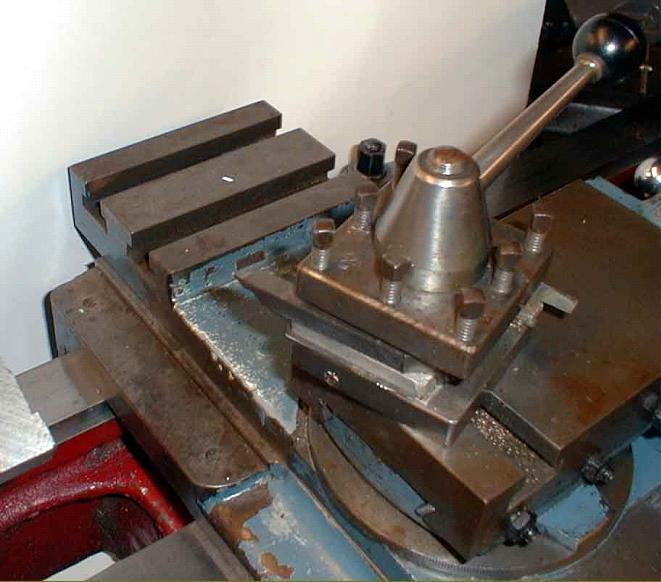 Finish machining was carried out on a large horizontal miller with a ganged-cutter set-up. A lot of the other operations were performed on a couple of large lathes with box jigs bolted to faceplates. As I didn't work in the machine shop I cannot, unfortunately, remark on many of the operations nor make of machine tool employed. Most of the factory's equipment was very old and no investment had been made for many years. A particular machine I did study as being of interest was the one that made the leadscrews. I believe that this was made within the works, but I am not sure. 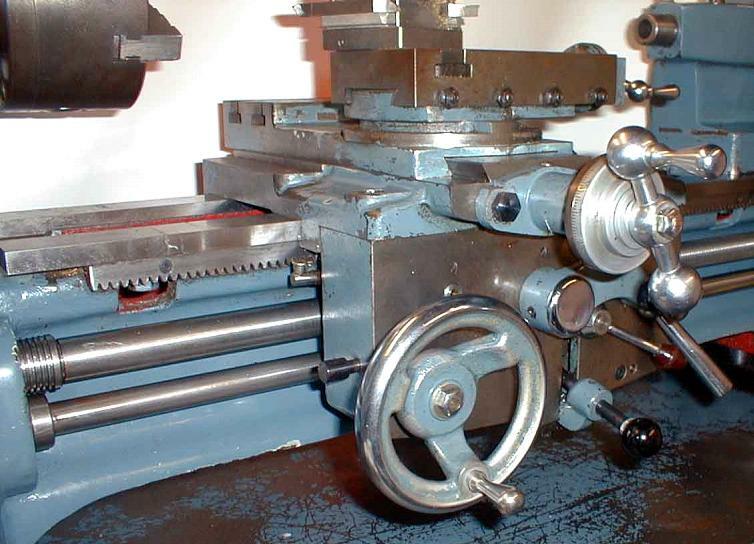 It looked to be based on an old centre lathe but was equipped with two leadscrews, one right hand, one left hand. One was geared to give the correct pitch of 8 t.p.i the other geared up to give a course pitch of 1 or 2 t.p.i. 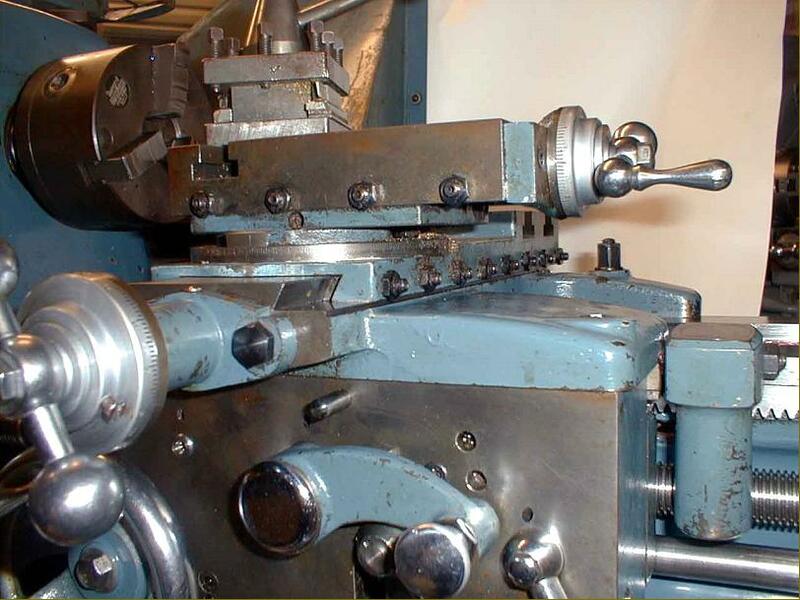 The leadscrew was set up in a collet chuck and supported by the tailstock and two travelling steadies; the first cut was put on and the machine started. At end of its travel the tool was retracted and the leadscrew gearing changed over so that the carriage returned at high speed - whence a new cut was applied and the process repeated. All the operations were automatic and activated by cams and ratchets. When leadscrews came off the machine they were bent like a banana due to the stresses being relieved; they were straightened by being supported on V-blocks and pressed under an arbor press. This machine made also made the cross and top-slide screws - with dummy screws made in threes, tapered in stages, fluted, hardened and then used as taps for the cross and top slide nuts. Bedways were made from hardened-and-ground steel strips, with blind tapped holes in their bases threaded to carry studs that held the rails to the bed. The bed castings were finished by carefully hand-scraping the way locations using a dummy bed as a surface plate. I cannot comment on the building of the headstocks, as I wasn't involved with them at all - but I can remember a jig being used for setting the thrust bearings on the variable-speed drive. The saddle and apron assembly was straightforward and all the bearing faces were scraped in as matching pairs. The swivel markings on the top-slide and the tailstock barrel ruler graduations were both rolled in with hardened circular dies. Built along traditional Norton "quick-change" lines the screwcutting box employed unhardened, machine-cut gears. The boxes were '"run in" on a dummy machine, the process entailing the mechanic holding the selector lever hard into mesh to bed-in any unevenness, followed by a thorough wash out and a re-oil. This dummy machine was interesting: it was a brand-new Raglan lathe that had been dropped while being loaded and had snapped off just in front of the chuck. The decision was taken not to rebuild it, but to give it to the fitters as a machine for polishing shafts/bushes to obtain a precision fit. During the time I was with the Company the build list consisted of centre lathes, a couple of capstans, some training lathes - but no millers. The spray shop was also on the first floor and run by two guys who were responsible for all the preparation and final paintwork, the machines being painted only when they were finished and signed off. The rough castings were prepared with a thick filler paint made by a Company called Trimite (who are still in existence http://www.trimite.com/). The first coat was literally trowelled on, the second coat applied by a paint brush and then, as it became skin dry, repainted with cellulose thinners. This had the effect of 'melting' the topcoat and allowed it to flow to a smoother finish. The job was given overnight to dry and then rubbed down with wet-and-dry paper. Two more coats were then applied by spraying, with a light sanding between. The finish consisted of one base coat and two topcoats of a special cellulose-based paint, again by Trimite, a product also supplied to Myfords - the finish was thus first-class and far superior to that on competitors' machines. The works manager when I was there was a wonderful man, the highly-respected Mr. Gibbs, who had come from Myford Engineering, the new owners.. The much improved and more substantial Raglan "Five-inch" carriage assembly. One of the problems with the original "Little John" design was that, under load, the power feed selector lever (which slid along the bottom of the apron and engaged upwards into one of two slots) was sometimes reluctant to move out of mesh . The problem was fully addressed in the new design - and few lathes have ever had a quicker or more positive movement to their power-feed controls. The drive was engaged by raising the spring-loaded lower central lever in its slot and could be instantly released by pressing the acorn-tipped lever immediately above it. The long button protruding from the left hand edge of the apron operated the automatic power disengage. Raglan Five-inch headstock. Although the backgear engagement lever was conveniently located on the front face of the headstock, before it could be engaged the changewheel guard had to be opened and a very awkwardly sited pin pulled out of engagement with the spindle bull wheel.